It’s seems like it’s taken forever to actually get some info, but finally below are episode descriptions for the first three episodes of True Blood Season 6. They are sure messing with the titles this year as they have changed them for all three episodes from what was previously reported. 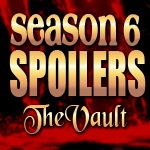 We will update our Season 6 Episode Guide with the new titles below. What we know is that Bill is reincarnated and gets used to his new powers, Eric seems to be dealing with things on a local level, and there is an impending castastrophe. Yikes, looks like things are really getting hot in Bon Temps this year. Can’t wait! PLEASE NOTE: This week the True Blood Music Volume 4 was announced with a full list of songs to be included on the CD. “Don’t Let Me Be Misunderstood” – Eric Burdon with Jenny Lewis is listed on the CD which would make us speculate that this new title might not be correct. Thanks for providing, Lynn … definitely food for thought. Bill & Sookie….Bring it on!